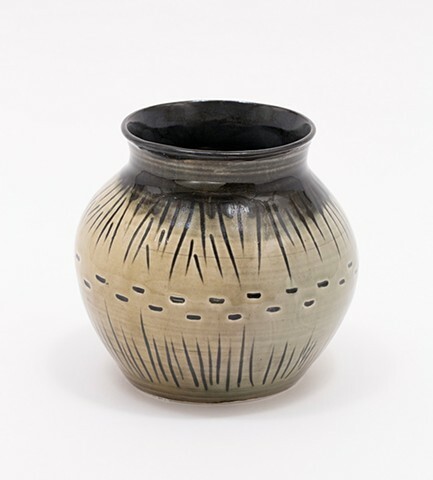 Glossy, infinite – This vessel depicts blades of grass framing a path of footprints. The surface also depicts a narrative: Our current culture stresses a need for each individual to find their “own way.” Historically, individual paths were more deeply entwined in the greater community. The individual’s path was shared with others. Unfortunately, modern society has increasingly withdrawn from the community experience. Thus, outlying a barren lonely road of individuality, a prison of self, eluding the creativity and freedom, which emerges from shared experiences.